Hi guys! Don't forget to enter my 2 giveaways that end later this week. Spoiler alert, there's another giveaway coming later this week! I'll be the first to admit that my swatches tonight aren't my best work. It happens, but I don't really have enough time to redo them. They come from the Rustic Retreat collection from Dare to Wear which is the polish side of LeChat. 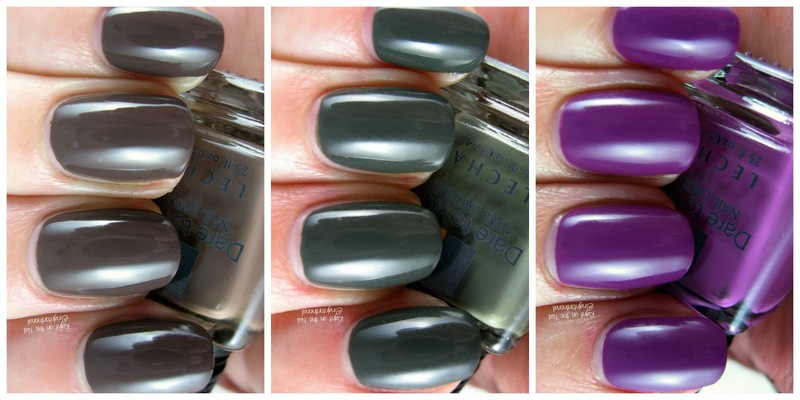 LeChat is best known for their Perfect Match gel line that you may have seen at your local nail salon. The brand can be a little hard to find (I found these at my local nail supply store), but if you still haven't found it locally, you can still purchase these on Transdesign. The entire 6-piece Rustic Retreat mini set will set you back a whopping $4.95. Yeah, you read that right. Swatch time! Wow, what a unique color! Down to Earth is a dusty green creme with some grey undertones. Now that I think of it, all three of these colors scream fall to me. I think the collection is worth it for this polish alone. As you can see this dries much darker than the bottle color. Pictures show 2 self-leveling coats. Up next is Hazelwood which is a deep cool brown creme. When Googling Hazelwood, I totally didn't think of the hazel tree (which is where hazelnuts come from). The more you know. I'm often bad at knowing how particular nuts and fruits grow. Thanks for making me think more, LeChat. Like Down to Earth, Hazelwood dries a shade or 2 darker than the bottle color. This was also 2 coats, but make sure to take your time on the second coat so you don't get any bubbles. And finally I have Wild Berry which is a rich berry creme. Purples are notoriously hard to capture correctly, and this is no exception. Again, this is just 2 easy coats. If you are already purchasing from Transdesign, I definitely recommend picking up this mini collection. Mini bottles can be hard to work with sometimes, but I'm happy to report that these are pretty awesome and have 7.4 mL in each. You can learn more about LeChat on their Facebook, Twitter, or Instagram pages.